In order to improve safety for all modes of transportation, the City’s Public Works Department and Transportation Department are implementing and improving a bicycle route system, as directed by the Austin City Council per City Ordinance No. 20090611-075 (The Austin Bicycle Plan). 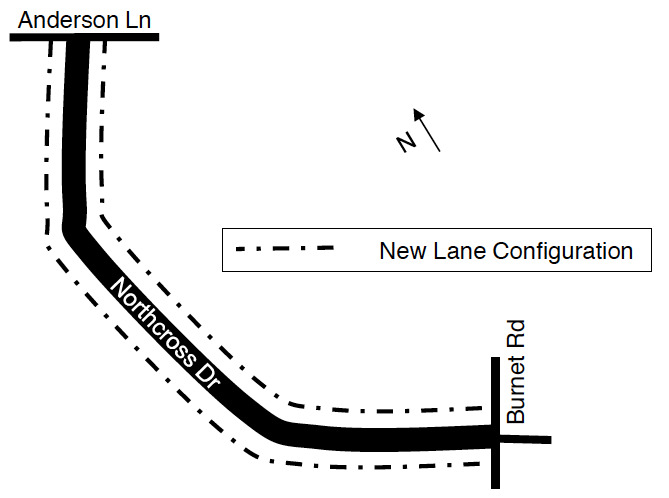 Northcross Drive from Anderson Lane to Burnet Road, as shown in Figure 1, is part of Route 20 of the City of Austin bicycle system. You are receiving this notification because you live on and/or own property adjacent to Northcross Drive in Austin, Texas, and/or are a stakeholder in the area. Usted está recibiendo esta notificación porque vive cerca de Northcross Drive, es dueño de propiedad cerca de Northcross Drive, o es parte interesada de Northcross Drive en Austin, Texas. Si necesita un documento traducido en español, llame a (512) 974-7092. In coordination with routine street maintenance (road re-surfacing and re-striping), and to improve safety in the corridor for both motor vehicles and bicycles, the street striping on Northcross Drive will be reconfigured to include bicycle lanes. The corridor’s safety and mobility, as well as the results of an intersection capacity analysis, were considered to determine these modifications. To accomplish this reconfiguration, existing travel lanes will be modified on Northcross Drive as shown in Figure 2. On-street parking will not be permitted in the bicycle lanes. Signalized intersections will differ from the typical cross section to include additional turn lanes as necessary to maintain motor vehicle capacity. If you have questions or feedback, please contact Neil Kopper at 974-7166 or neil.kopper [Email address: neil.kopper #AT# austintexas.gov - replace #AT# with @ ] no later than December 12th, 2014. Feedback based on local experience frequently results in improvements to initial project proposals. If feasible, modifications to this proposal can be made after all input has been received.